I'm the kind of person who likes to cook without following a recipe. I just follow my intuition and with a lot of tasting in between, the end result is usually pretty tasty! But there's one recipe I follow religiously, and that is my pizza recipe. It's not exactly my recipe, but I've made it so often and have gotten many compliments, that I'll never need another pizza recipe in my life. If you're still eating freezer pizzas then 1) shame on you and 2) I promise you'll never want anything else after making this recipe once or twice. They're thin, crispy and simply delicious. The dough is key! Let me show you how to make perfect pizzas. Sprinkle some flour (generously) on your kitchen worktop, take the dough ball and start kneading it for about 5 to 10 minutes, until you have a 'flexible' and smooth dough ball. It shouldn't be too sticky but also not too dry! Pop it back into the bowl and cover with a clean towel. Leave it for at least an hour at room temperature so it can double in size (I place it next to the AGA). In the meantime you can make your sauce and/or pesto! 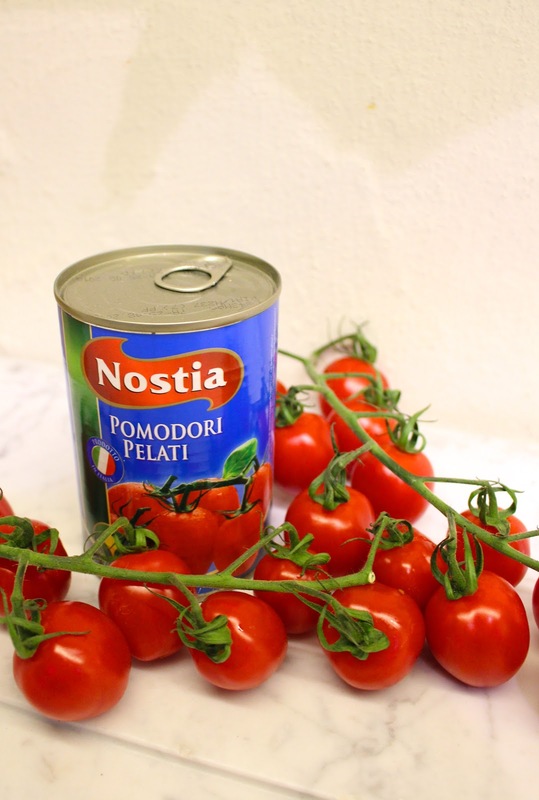 This is better than any store-bought tomato sauce because you know exactly what's in it (no sugar!) Put all the ingredients in a kitchen processor and blend until it's completely smooth! Add some salt & pepper to taste. I also love fresh pesto on my pizza so I put some on after the pizza has come out of the oven. The colour is super vibrant and it gives the pizza a fresh touch. Blend all the ingredients below in a food processor until you've got a smooth pesto. 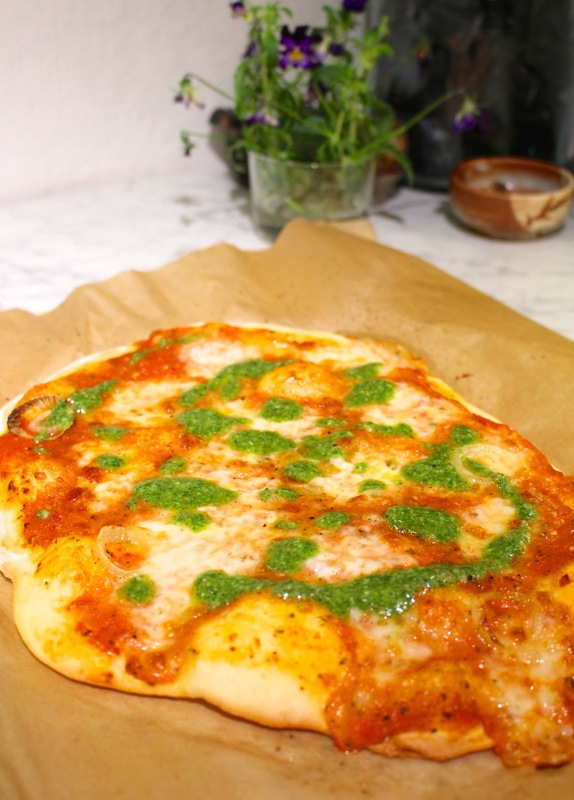 Once an hour has passed, and you've prepared the tomato sauce and pesto, it's time to roll out the dough. Preheat the oven to 220 degrees. Divide the dough into four equal parts and knead each one for a few minutes on a floured worktop. It shouldn't be sticky anymore! Now use a rolling pin to roll out the dough into thin pizza shapes. Once it's rolled out thinly, transfer onto a baking tray with baking parchment. Pop the pizza in the oven (I usually bake two pizzas at a time) for about 12 minutes until the cheese has melted and the edges have gone crispy. Now it's time to put the pesto on top (you can also do it before the pizza goes in the oven but then the pesto goes a bit brownish!) I also like to add some rocket on top. I usually make a big salad on the side to make a simple dinner. Now I know what you're thinking, it looks like a lot of work for a simple pizza, but trust me it's 100% worth it! And it gets easier every time you make it. I make this about once a month and since I have this recipe I haven't eaten one single freezer pizza. This is the real deal. So next time you're having pizza cravings, promise me you'll try this recipe?